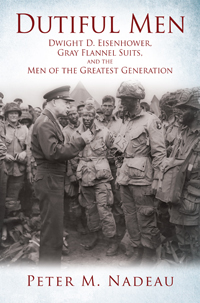 Dutiful Men is the story of the men of the greatest generation and their legendary leader Dwight Eisenhower. This is the definitive account of the men who were born at the beginning of the twentieth century, survived the Great Depression, won the Second World War, and built a new America after the challenges of their youth. Dutiful Men tells their story as men revealing for the first time the origins of their common understanding of manhood and how that concept was modeled by their general and president. “I Like Ike” was more than a campaign slogan from the gray-flannel-suited men of the 1950s. It reflected an adherence to a man as well as his model of manhood. Historians have previously studied how conceptions of male identity have informed, shaped, and altered the American presidency, but Dwight Eisenhower and his administration have thus far been neglected in these studies. Dutiful Men examines Eisenhower’s understanding of what it means to be a man and how that definition emerged, challenged, overtook, and eventually surrendered to modern constructions of masculinity. Dutiful Men is a must-read for anyone interested in or related to a man of the greatest generation. Peter M. Nadeau (Ph.D, Oklahoma State University) is the Dean of Faculty and Advanced Placement history instructor at Redeemer Christian School in Ocala, Florida. He has taught and written about United States and European history for over two decades. His research specialties include the modern presidency, World War II, and men’s history. Married and the father of three children, in his leisure time he enjoys travel, reading, movies, and discovering obscure historical sites.